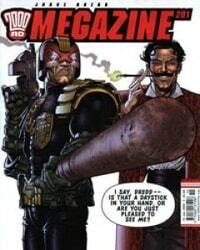 Judge Dredd Megazine (Vol.5) Average 0.00/5 - out of 0 total votes. First issue of the Judge Dredd Megazine (volume five) and the first issue (since 1992) to use the original numbering. All new stories this issue except for the Thrill-Power Overload! article which continues from volume four (issue 18).